What you’re about to read is a jumbled mess of my enthusiasm for cruise. I did have an idea of what I wanted to write before I started, but then my fingers took command and I was left with this. 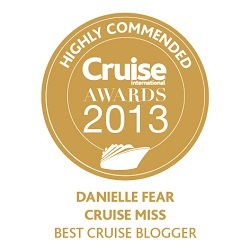 As it is ALL about cruise, hopefully that will save the blog! Cruise is my life, I adore it and the massive community it has created. It’s so much more than just a holiday choice, for many people it’s also a lifestyle. There are dozens of forums, groups and pages spread across social media that are dedicated to this amazing industry, some of them are even dedicated to specific cruise lines and ships. You really don’t get this level of passion or interest when it comes to groups for land-based holidays. Tell me, when was the last time you were in a new destination and you heard someone say, “the fishes on the carpet lead me in the right direction” or “I enjoyed my breakfast in the Suez Canal this morning” while talking about a holiday they’ve had on land? It doesn’t, and in many cases, physically can’t happen. Cruising is so unique. We look at our ships as part of us and they are what bring us together. We have so much more to talk about than JUST the holiday experience because the ship herself affords us many luxuries that can only be found at sea. There’s something almost addictive about waking up to a new view every morning. I sit in my office and look out of the window, as usual I can see a huge RV, a few trees and several other houses, it’s not quite the same as going out onto the deck and spotting a pod of dolphins playing in the water. I was clearly born to wander because I can’t sit still, and I thrive on an ever-changing scenery. The same view from my window every day is only tolerable because I can dive into magical lands and amazing cruise ships via my laptop – a blessing that comes with working in the cruise industry full-time. If I hadn’t discovered cruising back in 2007, I genuinely have no idea what I’d be doing right now. I really could go on about this for weeks, but I’ve done what I came here to do (kind of) and that was to drop a short “cruise love note” before the #ChooseCruise month comes to an end – a month that has shown everyone how amazing cruising is! I’ve been on more than 55 cruises and sailed to some of the finest destinations on the planet. I wake up every day feeling so incredibly fortunate to have the opportunities that I do. I am living proof that if you work hard for something you’re passionate about, you will reap the rewards and live your best life! Check out my latest project where everyone that loves cruise is welcome: Cruise Climber.